This civil rights movement timeline focuses on the struggle's final years, when some activists embraced black power, and leaders no longer appealed to the federal government to end segregation, thanks to the enactment of the Civil Rights Act of 1964 and the Voting Rights Act of 1965. Although the passage of such legislation was a major triumph for civil rights activists, Northern cities continued to suffer from "de facto" segregation, or segregation that was the result of economic inequality rather than discriminatory laws. Some turned to the black power movement, feeling that it had a better chance of rectifying the sort of discrimination that existed in the North. By the end of the decade, white Americans had moved their attention away from the civil rights movement to the Vietnam War, and the heady days of change and victory experienced by civil rights activists in the early 1960s came to an end with King's assassination in 1968. On Feb. 21, Malcolm X is assassinated in Harlem at the Audubon Ballroom apparently by Nation of Islam operatives, although other theories abound. On March 9, King leads a march to the Pettus bridge, turning the marchers around at the bridge. 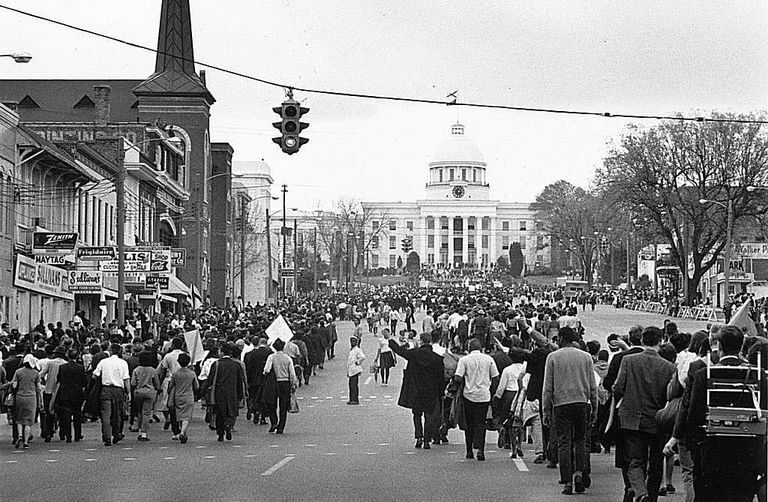 On March 21, 3,000 marchers leave Selma for Montgomery, completing the march without opposition. On March 25, around 25,000 people join the Selma marchers at the Montgomery city limits. On Aug. 6, President Lyndon B. Johnson signs the Voting Rights Act into law, which bans discriminatory voting requirements, like requiring people to complete literacy tests before they registered to vote. White Southerners had used this technique to disenfranchise blacks. On Aug. 11, a riot breaks out in Watts, a section of Los Angeles, after a fight erupts between a white traffic officer and an black man accused of drinking and driving. The officer arrests the man and some of his family members who had arrived at the scene. Rumors of police brutality, however, result in six days of rioting in Watts. Thirty-four people, mostly African Americans, die during the riot. On Jan. 6, SNCC announces its opposition to the Vietnam War. SNCC members would feel increasing sympathy for the Vietnamese, comparing the indiscriminate bombing of Vietnam to racial violence in the United States. On Jan. 26, King moves into an apartment in a Chicago slum, announcing his intention to start a campaign against discrimination there. This in response to the increasing unrest in Northern cities over prejudice and de facto segregation. His efforts there are ultimately deemed unsuccessful. On June 6, James Meredith embarks on a "March Against Fear" from Memphis, Tenn., to Jackson, Miss., to encourage black Mississippians to register to vote. Near Hernando, Miss., Meredith is shot. Others take up the march, joined on occasion by King. On June 26, the marchers reach Jackson. During the last days of the march, Stokely Carmichael and other SNCC members clash with King after they encourage the frustrated marchers to embrace the slogan of "black power." On Oct. 15, Huey P. Newton and Bobby Seale found the Black Panther Party in Oakland, Calif. They want to create a new political organization to better the conditions of African Americans. Their goals include better employment and educational opportunities as well as improved housing. On April 4, King makes a speech against the Vietnam War at Riverside Church in New York. On June 12, the Supreme Court hands down a decision in Loving v. Virginia, overturning laws against interracial marriage as unconstitutional. In July, riots break out in Northern cities, including Buffalo, N.Y., Detroit, Mich. and Newark, N.J.
On Sept. 1, Thurgood Marshall becomes the first African American appointed to the Supreme Court. On Nov. 7, Cal Stokes is elected mayor of Cleveland, making him the first African American to serve as mayor of a major American city. In November, King announces the Poor People's Campaign, a movement to unite the poor and disenfranchised of America, regardless of race or religion. On April 11, President Johnson signs the Civil Rights Act of 1968 (or the Fair Housing Act) into law, which prohibits discrimination by sellers or renters of property. Exactly a week earlier, Martin Luther King, Jr., is assassinated as he stands on the balcony outside his motel room at the Lorraine Motel in Memphis, Tenn. King visited the city to support African American sanitation workers there who'd started a strike on Feb. 11. Between February and May, African American students protest at major universities, including Columbia University and Howard University, demanding changes in faculty, living arrangements and curriculum. Between May 14 and June 24, over 2500 impoverished Americans set up a camp called Resurrection City in Washington, D.C., under the leadership of the Rev. Ralph Abernathy, who is trying to carry out King's vision. The protest ends in riots and arrests without the strong leadership of King. Between April and May, African American students hold protests at universities, including Cornell University and North Carolina A & T University in Greensboro, asking for changes such as a Black Studies program and the hiring of African American faculty. On Dec. 4, Fred Hampton, chairman of the Illinois Black Panther party, is shot and killed by police during a raid. A federal grand jury refutes the police's assertion that they fired upon Hampton only in self-defense, but no one is ever indicted for Hampton's killing. Updated by African-American History Expert, Femi Lewis.